President Barack Obama speaks during a town hall meeting at the Summit of the Washington Fellowship for the Young African Leaders Initiative in Washington, D.C., July 28, 2014. Black people who look to defend President Barack Obama against other black people who claim he hasn’t done anything particularly “black” as president have had plenty of ammunition this week and will have more the next. 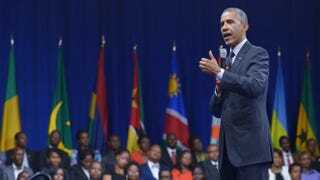 The first black president, the son of an African immigrant, is also the first to convene a U.S.-Africa Leaders Summit, officially starting next week. But the Obama machine has already sounded the representative cues, with the president telling Africans to stop making excuses and blaming colonialism (a favorite theme of his, it seems, no matter what black group he deals with), and the first lady—ever the soul sister, when the need arises—embracing both her African ancestry and her African sisters! Meanwhile, Republicans in the U.S. Senate, determined to stop Obama from doing anything rational, have created a diplomatic logjam. More than 30 ambassador candidates, stifled from representing American interests to about a quarter of the world, are frozen in political limbo, their embassies without steady leadership. The candidates are waiting for the Senate to confirm them, but the Senate Republicans won’t vote. Secretary of State John Kerry is as outraged as a diplomat is allowed. At least eight nations of those without ambassadors are African: Sierra Leone, Niger, Namibia, Cameroon, Lesotho, Mauritania, Zambia and Algeria. (One media outlet lists the African number as high as 13.) So the Obama administration is attempting to create ties with African leaders here, with the obvious irony that it is not able to forge official diplomatic ties in many nations there, where it really counts. “It sends the message that the United States doesn’t care,” says U.S. Rep. Gregory Meeks (D-N.Y.), co-chair of the Congressional Black Caucus’ Africa Taskforce and a member of the House Foreign Affairs Committee. He wants the Republicans in the Senate to “stop playing political games” and give Obama the 60-vote threshold he needs to approve these appointments so that Africans and Americans, especially African Americans, can do business. The role of an ambassador cannot be overstated, explains Moses K. Tesi, a professor in the political science department of Middle Tennessee State University and editor of the Journal of African Policy Studies. An ambassador, Tesi describes, is one of the most important on-the-ground liaisons between the business communities of both nations, including those who import and export. He or she is also a leader in cross-cultural exchanges, whether educational or cultural, Tesi adds. Without an ambassador, Tesi warns, the U.S. cannot leverage its power in ways that benefit all parties—leverage that nations like China, Japan and Brazil are fast developing with many of the 54 African nations. He gives a very painfully political example: Boko Haram, the radical Muslim terrorist group that kidnapped 200 Nigerian girls from their school this spring, is also active in Cameroon and Chad. Without a U.S. ambassador in Cameroon to gather information and collaborate with others, it leaves a “void” that can be—and will be—exploited, he argues. Perhaps the most important issue is not the Senate Republican obstruction or the not-as-exciting-as-it-was-in-2008 Obama symbolism, but how Africa will develop itself on its own terms. After all, as both Hueys and others have reminded us, the United States was built on stolen land. Is the U.S. just another greedy 21st-century neocolonial power in Africa, trying to shove other greedy 21st-century neocolonial powers out of its way? To say the continent has serious issues to face is an understatement. The Ebola-virus outbreak has caused Sierra Leone, one of the African nations without a U.S. ambassador, to declare a state of emergency. Nations and corporations across the world are revolutionizing farming in Africa—and kicking small farmers off their land to do so. The human rights violations in some of the African nations cannot be easily ignored, and shouldn’t be. And, speaking of human rights, not only have “our girls” in Nigeria not been brought back after more than 100 days, but Boko Haram just this week kidnapped the wife of the Cameroonian vice minister and is responsible for a 10-year-old girl blowing herself up on a Nigerian college campus. But the continent has always had serious issues to face, at least since it was carved up and raped in every conceivable way by the European powers at the Berlin Conference in 1886. If U.S. ambassadors can help Africa work for the Africans themselves as much as they provide a liaison to what the late Gil Scott-Heron used to call “the Dollar Eagle,” then the Republicans in the Senate deserve all the scorn the American public can give. But if all of this—the summit, the ambassador issue—is just another opportunity to carve up the continent—kindly, this time!—then it might be appropriate, in this 50th-anniversary season of African independence and movement power, to do what the Obamas seem to be suggesting: Stop making excuses (for Obama’s white conglomerate-loving leadership), embrace our heritage, and raise up some ’60 flags and some fists on both sides of the Atlantic. Todd Steven Burroughs, an independent researcher and writer based in Hyattsville, Md., is the author of Son-Shine on Cracked Sidewalks, an audiobook on Amiri Baraka and Ras Baraka through the eyes of the 2014 Newark, N.J., mayoral campaign. A black-media historian, he has taught at Morgan State and Howard universities. He is the co-editor, along with Jared Ball, of A Lie of Reinvention: Correcting Manning Marable’s Malcolm X and the co-author, with Herb Boyd, of Civil Rights: Yesterday & Today. For more, read "A Cheat Sheet for the US-Africa Leaders Summit"